Make sure you're kids are fully equipped for battle with this Shield Squad Kids Football Drill Top in Italy Blue and White from Nike. 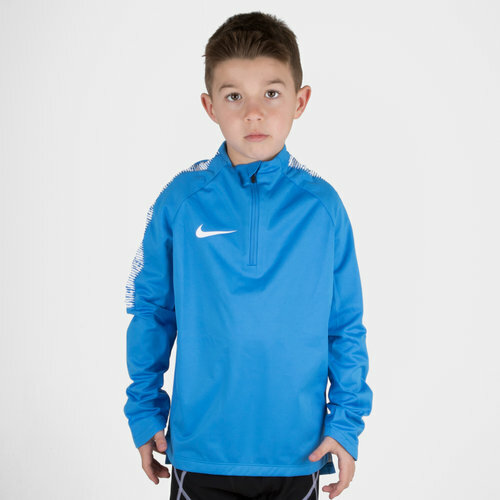 This classic looking football drill top from Nike comes in a sleek blue and white design and feature NikeShield technology which blocks moisture so that you can stay fast in the rain instead of being slowed down by wet gear. Stretchy 3-D backing enhances airflow inside the top so you're kept cool and comfortable. The stretchy fabric and raglan sleeves with "invisible" thumb loops are designed to provide wet-weather coverage without adding restrictions. A stand-up collar increases the coverage of the top and with a zip, the wearer can choose how they wear this top. Made from 100% polyester, side stripes below the arms display breathable, accent-coloured mesh when flexed.